Dr. Erin Gilbert (Kristen Wiig) doesn't believe in the existence of the paranormal anymore, even though she wrote a guide to it in the past with her ex-colleague Abby Yates (Melissa McCarthy). 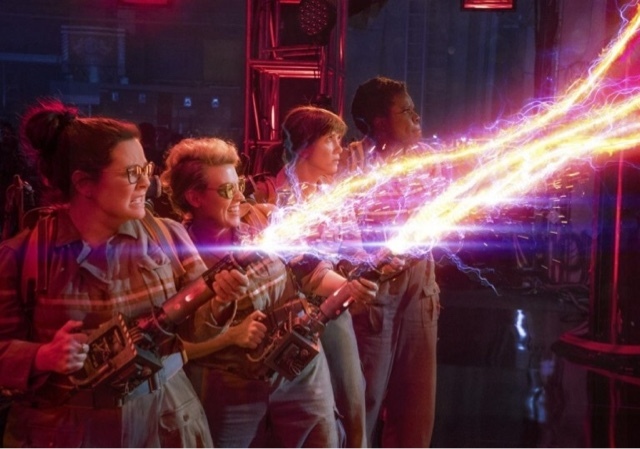 Yet, when she witnesses a full fledged stage 4 apparition her beliefs are changed once more and with the help of Yates, Holtzmann (Kate McKinnon) and Patty Tolan (Leslie Jones), founds a team to fight ghosts who are rampaging through the city. Director Paul Feig is a comedy master. He is the mind behind Freaks and Geeks, Bridesmaids and Spy which makes him an instant check out for me. The way he weaves comedy through character is something not many directors in his camp have achieved to his effect, so of course when you go to check out his new film there are always high expectations no matter what. Ghostbusters, whilst far from being any kind of disaster, has a good sense of humor that does not quite translate into the flow of endless laughter it thinks it is, nor the kind of which we are used to with Feig. I am going to say right up front that I'm not a big enthusiast of the original Ghostbusters. I saw the film once, liked it and for me it ended there. All I wanted from this new iteration was a good film with laughs, and I couldn't care less of anything surrounding that. Fortunately, that is exactly where the film is good. It's just another comedy film and that is what its trying to be. Whereas it may fall apart in its plot and third act, the cast is killer and the laughs which are present are really good. For me the couple that made the film was Chris Hemsworth and Kate McKinnon. They just had to be on screen for my attention to be sparked and for me to start laughing. That is definitely due to the fact that they both have amazing, scene stealing characters to work with. They made me laugh so hard because they were written so brilliantly. This is really Feig's tact for comedy coming alive in the best way. Their gags were hilarious, they just had to say a word or make a move and it made sense to laugh for me, and that is really remarkable. Not that their costars aren't doing a good job too, they actually all have their moments, yet being written slightly thinner they didn't emerge or stay with me as much as the best two. And that is where a lot of the film fell apart for me. It was simply way too forgettable. The third act had no impact on me, as I wasn't feeling anything. It just came to be this by the numbers resolution that had no character to it. What, up to that point, was a quite entertaining comedy with only little flaws, became a huge on screen mess of which I can hardly remember anything. This was certainly for Feig a very, very hard task and it turned out to be a bad day at the office, and for a movie like this to come out of that is saying something about him: he doesn't deliver what we might expect, but sparks of his brilliance still manage to make it through to produce what is a more than decent comedy effort.